Yesterday I mentioned that I would share I would share today the significance of the choice of the dove when Solomon describes his beloved in the Song of Songs. Remember he calls her ‘My dove’ and then as the relationship develops she too addresses him similarly. 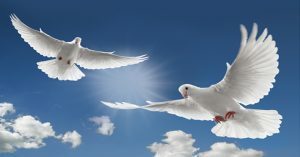 We know that in scripture the dove is used to symbolise the Holy Spirit and this gives us a picture of both the character and the power that the Holy Spirit wishes to impart in us as He comes to indwell. He comes to develop peace and purity, grace and gentleness, sensitivity and humility. His two wings permanently remind us of the need for balance in our search for truth and in our expression of ministry. It reminds us of what Jesus described as the Father’s understanding of pure worship…”The Father seeks those to worship Him in Spirit (supernatural authority and demonstration) and in Truth (Scriptural accuracy and character integrity). Without both, one wing only, we fly around in the circle of error and imbalance. However here the word dove is used for different reasons. Where is the dove so often found? “O my dove, you are in the clefts of the rock, in the secret places of the stairs, let me see you, let me hear your voice; for sweet is your voice, and your appearance is so wonderful to me”. The dove makes her nest in high places. The King James text says, “in the secret places of the stairs.” Other translations suggest literally, “in the places of going up.” This is a cry for ‘intimacy’. In order for us to have the fellowship with our Bridegroom it is necessary for us to get away from it all. It is necessary for us to be in that secret, quiet place away from all the busy turmoil of life. Yes, doves are peculiar birds in that they mourn. They are so sensitive to atmosphere and reflect it in their behaviour. I’m reminded of the Beatitude in Matthew 5 v 4 “Blessed are they that mourn (hunger, thirst, desire, yearn for God) for they shall be comforted”. The characteristic of the Bride and the Bridegroom for Her can only be described as an intimate deep yearning for each other as if in mourning. Lastly, the dove is a bird that doesn’t have peripheral vision. She can see only that which is directly in front of her. The dove, the Bride, only has eyes for her Bridegroom. Like-wise we only have eyes for Jesus. And… the dove does not have a gale bladder….that is the part of the bird that is bitter to the taste and is removed from a chicken before cooking. And Jesus, our Bridegroom, says that to us too today.